Silicon Valley startup shipping single serve coffee maker 2.0 compatible 100% Maui Mokka coffee pods with improved coffee grind and predictable fulfillment; subscribers pay $40.80 on a six-month subscription plan. Customers drive Pooki’s Mahi’s roadmap. 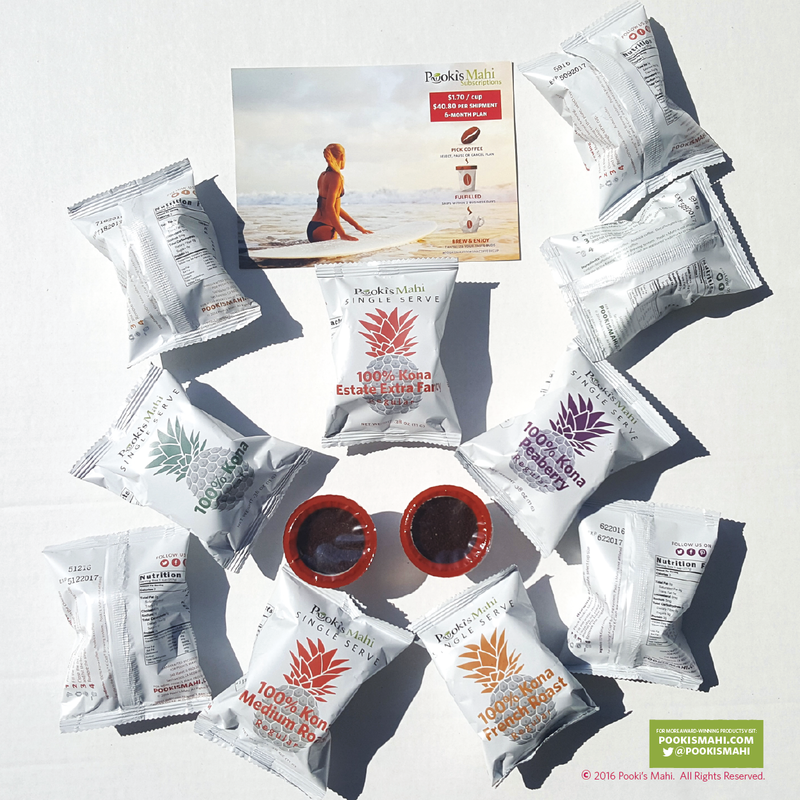 At $40.80 per shipment on a six month plan, our subscribers enjoy priority fulfillment, fixed pricing, two day delivery and access to new products in Pooki’s Mahi’s 100% Kona coffee pods product line. Silicon Valley startup Pooki’s Mahi of award-winning 100% Kona coffee pods announced it is now shipping single serve coffee maker 2.0 compatible 100% Maui Mokka coffee pods with an improved coffee grind priced at $40.80 per shipment on a six-month subscription plan. This is the third single serve coffee maker 2.0 compatible single serve pod for Pooki’s Mahi. 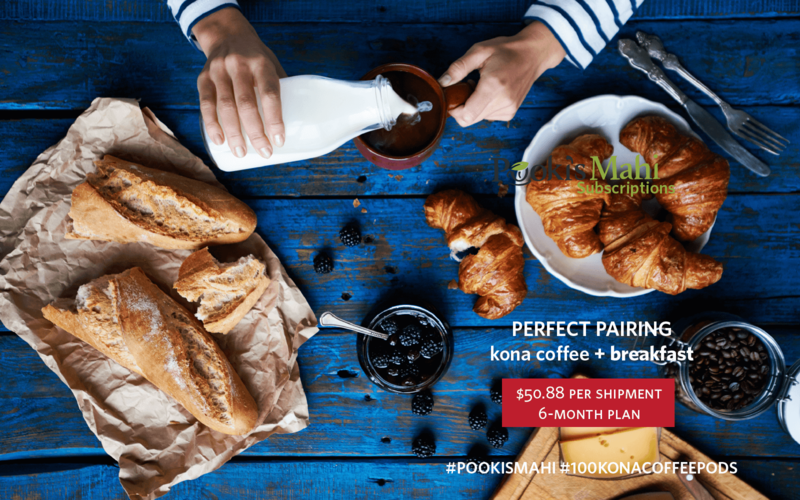 Currently Pooki’s Mahi offers one-time, monthly, three month and six month plans for five different 100% Kona coffee pods, four 10% Kona coffee blends, 100% Maui Mokka coffee pods and 100% Ka’u coffee pods. Pooki’s Mahi’s original single serves were not compatible with the newer single serve coffee maker 2.0 brewers. The work around was to use plastic clips that often melted after the second or third use. Pooki’s Mahi’s 100% Maui Mokka coffee pods will work in single serve coffee maker 1.0 and 2.0 brewers. Customers requested better coffee extraction to taste the berries, blackberry, candied citrus, dark chocolate, and cocoa. Pooki’s Mahi’s 100% Maui Mokka coffee beans are sourced from Ka’anapali, Maui and roasted in Oahu, Hawaii. Final cup manufacturing occurs in mainland USA. The peaberry coffee beans are much smaller compared to Kona coffee’s standard bean. Pooki’s Mahi took over one year to transition cup manufacturing facilities that could manufacture a single serve coffee maker 2.0 compatible cup made out of 99% mesh, 1% of #5 plastic and wrapped in a thinner wrapper. Pooki’s Mahi’s larger customers requested manufacturing certifications. Offering a single serve coffee maker 2.0 compatible 100% Kona coffee pods expands the existing customer base to include users of the new brewers. Pooki’s Mahi’s Maui Mokka coffee pods are made from 100% Maui Mokka coffee beans sourced from Ka’anapali, Maui and roasted in Oahu, Hawaii. Cup manufacturing and First Article Inspections (FAI) are completed in mainland USA in a BRC certified facility with Kosher and Fair Trade certifications. 1. 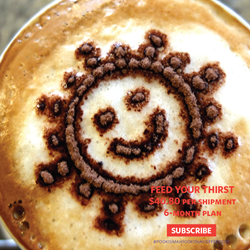 Pay $40.80 per shipment on a six month 100% Maui Mokka coffee subscription plan. 2. Price will increase to $54.99 per shipment on marketplaces like Amazon to monitor product listings and ensure resellers are selling at the manufacture’s approved price of $47.99. 3. 100% Maui Mokka coffees are prepared and packaged in machines not in contact with wheat/gluten, tree nuts, fish, shellfish, eggs, milk and soy. 4. Zero cost shipping to the Lower 48 states. 5. Zero cost shipping to Alaska and Hawaii on three-month coffee subscription plan. 6. Zero cost shipping to Canada and Mexico on six-month coffee subscription plan. 7. Nutrition information on the individual pouch. 8. Certification icons for Kosher and Fair Trade on the outside product label. Pooki’s Mahi’s existing customer base purchased 13 or more times. 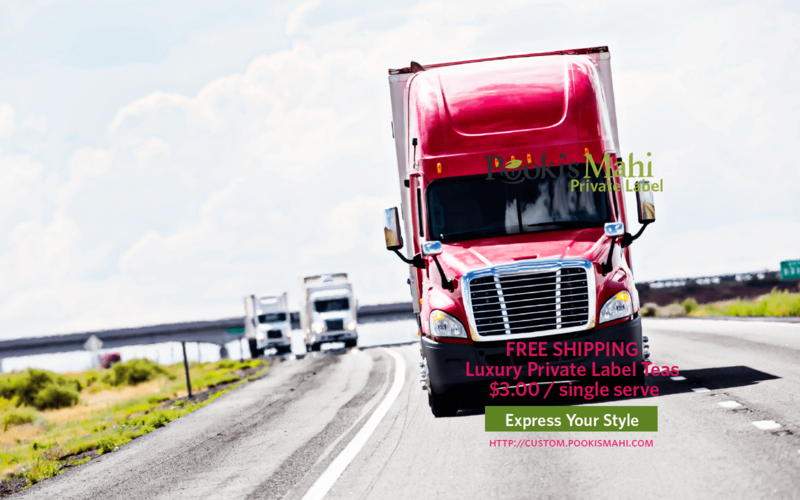 Subscribers of Pooki’s Mahi’s 100% Maui Mokka coffee pods continues to enjoy prioritized order fulfillment, free shipping to the Lower 48 States on all plans and be the first to access and review Pooki’s Mahi’s new products. For use in single serve coffee makers' brewing systems. Pooki's Mahi, The PMO Practice and Matcha Matcha Man are trademarks of Pooki's Mahi. 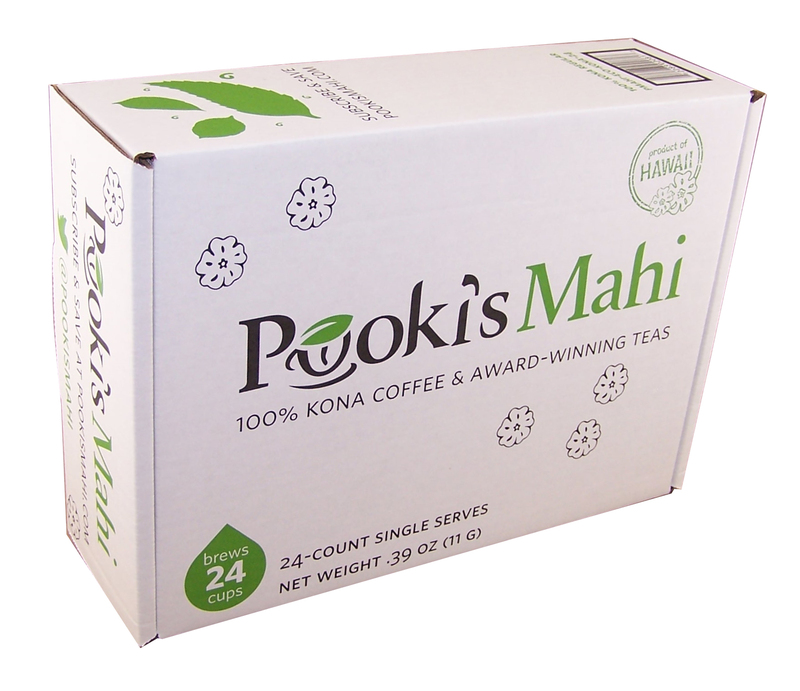 Pooki’s Mahi is a Silicon Valley-based private label manufacturer, distributor and etailer offering award-winning 100% Kona coffee pods, 100% Hawaiian single serve cups and 100% Kona Decaf coffee pods at reasonable prices. Since its online launch in 2013, Pooki’s Mahi products have been a favorite of customers, charities, celebrities and athletes and have been featured at red carpet events including Celebrity Gift Suites and Celebrity Poker tournaments. The products have been endorsed by many celebrities and athletes and seen on several television shows.